Spotting a small moth fluttering around your closet then discovering damaged fabric or other items can be shocking. Upon further inspection, you may even see the silken webs spun by the larvae, or the droppings they leave behind. 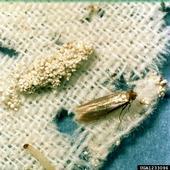 Clothes moth larvae attack wool clothing, carpets, rugs, upholstered furniture, furs, and much more. They will even feed on synthetic or cotton blends of fabric if they also contain wool. New Video from UC IPM on Pantry Pests! If you have insects invading your kitchen or pantry, or if you've ever opened stored food products and discovered pests inside, you'll want to watch this new video from UC IPM. It describes several types of pantry pests, foods they are attracted to, and includes steps on how to prevent, manage and eliminate them from your home. Pantry pests sometimes find their way into our homes undetected and can infest stored products like flour, cereal, pasta, dried fruit, nuts, and even pet food. Often, by the time these pests are noticed, they have infested and contaminated foodstuffs and may already be reproducing in your home, making management difficult. Below are some tips to help you clean up, monitor, and prevent pantry pest problems.